Jacob Jan Boerma has been captivated by cooking and good food from a young age. 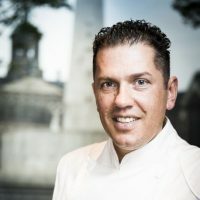 When he and his wife Kim Veldman opened restaurant De Leest*** in Vaassen in 2002, he did so with an impressive career behind him and skills learned in both national and international two and three Michelin starred restaurants. Barely half a year after opening the doors of De Leest, the restaurant received its first Michelin star. A second followed in 2006, and a third Michelin star in 2016 which Jacob Jan has achieved to keep until date. With The White Room, located in the former “Witte Zaal” of the iconic NH Collection Grand Hotel Krasnapolsky, Jacob Jan Boerma has spread his wings to Amsterdam. As a signature chef, he is the creator of The White Room. With respect for beautiful ingredients from the Netherlands, he is influenced by pure, honest and real cuisine from all over the world. Ingredients get the tasteful accessible attention in his recipes. Together with his team, led by Arturo Dalhuisen, he translates the inspiration he finds at home to the menu in Amsterdam. Under the signature of Jacob Jan Boerma, Grand Café Krasnapolsky offers an assorted menu, consisting of classical dishes with a ‘Boerma’-twist.